I am so excited for Christmas. So I thought I had better start making Christmas posts now. 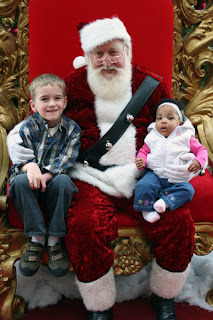 We took the kids yesterday to see Santa. Robby was so excited to tell him what he wanted. He cracks me up because every year when Santa asks him what he wants, Robby whispers the answer to him. I am not sure why, Santa can't hear him and always asks him a few times, and we always tell Robby to speak up, but he won't do it. He has to whisper. Zoe was just trying to figure out what in the world we were doing to her. She didn't seem to mind that she was sitting on Santa's lap, she just made the face she always makes when she sees I am trying to take a picture. Here is a picture of some of our presents this year. I love to wrap my presents in a different way each year. This year we went a little green. Robby wrapped almost all of his pictures in canvas bags. 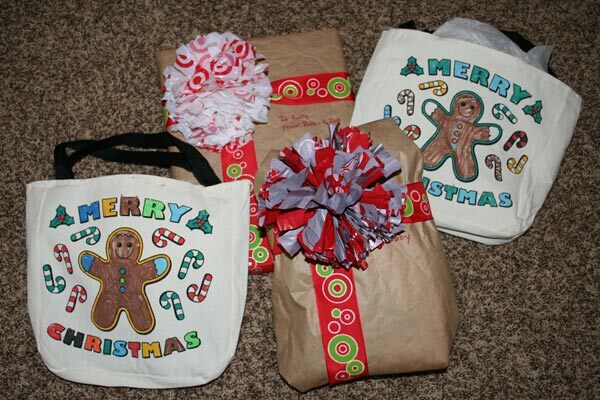 He colored all of them with fabric markers and then put the present inside. I think they turned out really cute. I wrapped my presents in some packing paper I got in a very large box with a very small present from Amazon.com. There was so much paper in the box, I couldn't stand to throw it away. The bows were made out of plastic shopping bags. I got the idea from this blog. I thought they turned out really cute. And finally, I didn't send out Christmas cards this year. That is because I hope to be sending out sealing and blessing announcements in the next couple of weeks and I didn't want to send two cards that close together. So instead, I thought I would leave a little Christmas treat on my blog. This is a video for a Christmas song by Jonathan Coulton. It is one of our family's favorites right now. I find Jonathan Coulton very entertaining. Most of his music is a little bit (or a lot bit) geeky, as you will see by this song. He offers a lot of free music on his site, which is nice. I should offer a little disclaimer though, some of his songs are not exactly clean, he does like to throw in a swear word or two (avoid the song First of May), but this one is perfectly okay and makes me smile. Enjoy.